Radio North has had a number of incarnations. 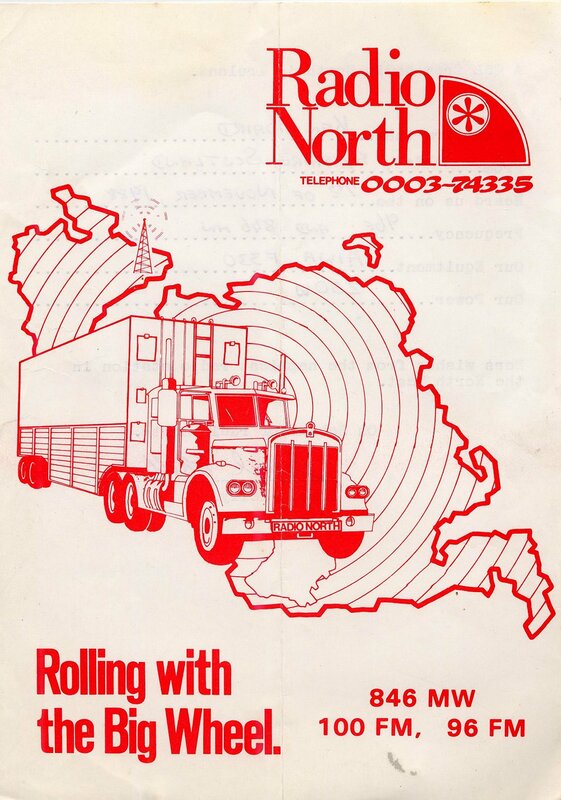 Radio North began life on 1386 briefly in late 1986, followed by a change to 1404kHz. It was noted in the Anoraks UK Weekly report of 23rd November 1986 as launching on the previous Tuesday (18th November 1986). 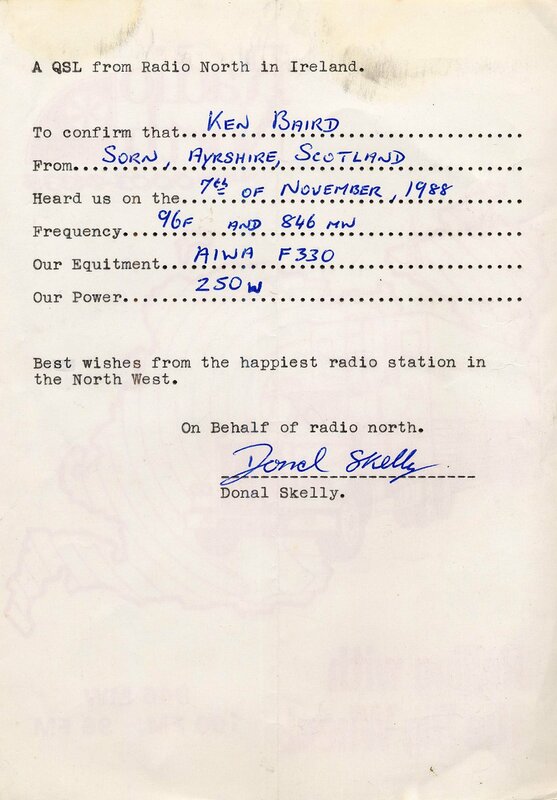 The story of Radio North will probably never be complete. Their 846kHz frequency was used pre 1988, and in fact up until the last night, 31/12/88. 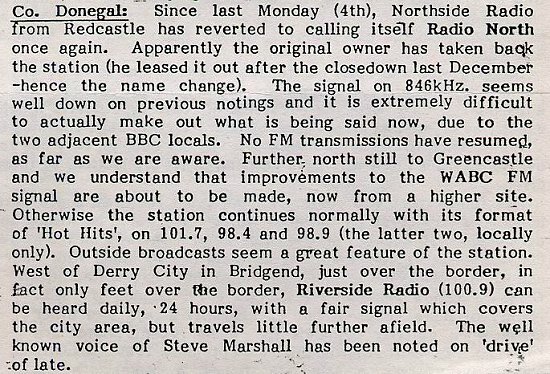 The transmitter was off air for a couple of weeks, but returned to the air as Northside Radio in mid January 1989. 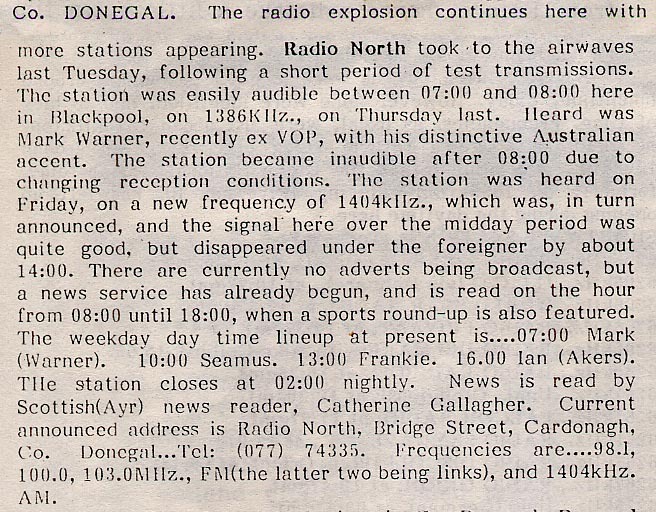 This name continued to be used until the name was changed back to Radio North. Ove the years there has been a North Atlantic Radio, a ghostly broadcast from the transmitter belonging at one time to RIVERSIDE 101, which was heard on 1008 with Mickey Henry. 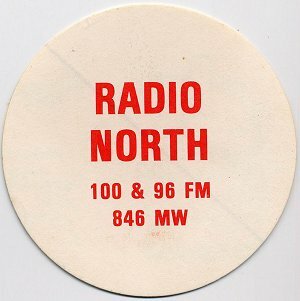 Then there was Radio North 2000, before the name simply reverted back to Radio North. We shall try here and piece it all together after so many years have passed. RADIO NORTH 846 closed at midnight on 31st Dec, to obey the Irish law. Signals in Scotland were very good because of Sunshine closing in Dublin on 846 the day before. At 1pm they were announcing that they were back on in the morning. UP - 1000 Jimmy Hofferty?? Was Paddy Simson the founder of Radio North?? The file for 16th Jan 1989 says first day. Unknown if this was personal first log, or station first day. In the summer of 1992, Riverside 101 went on air on 1008 using a UK made transmitter. 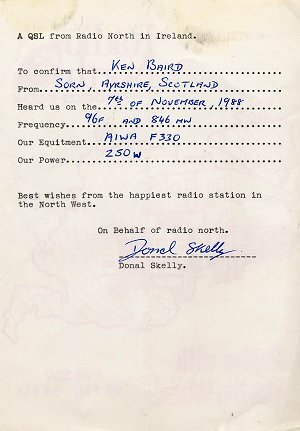 But on 8th September, Mickey Henry was heard broadcasting as Radio North on 1008, including tailor made jingles for 1008. This was heard one day only. On October 6th 1995, Radio North celebrated it's 6th anniversary, with a night out being held at Macnamarra's in Moville. Obviously this takes up back only to the 1989 version of Radio North. An old QSL card from 1988, details are on the back.